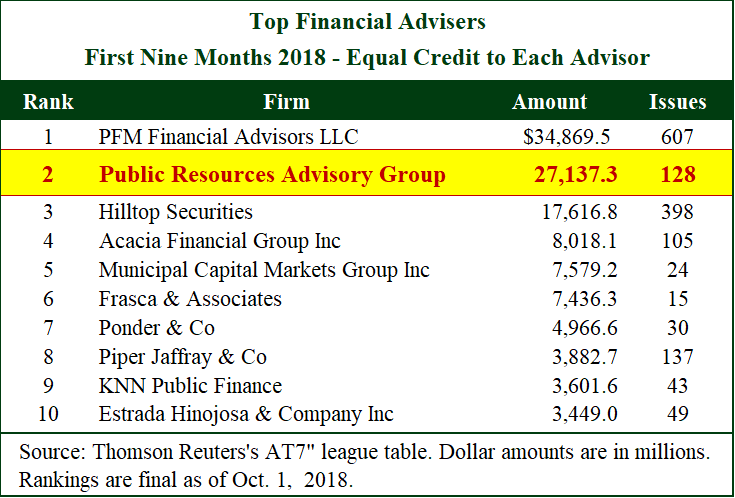 PRAG ranked #2 financial advisory firm in the nation in 2018 with 176 issues totaling $36.1 billion, according to Thomson Reuters. 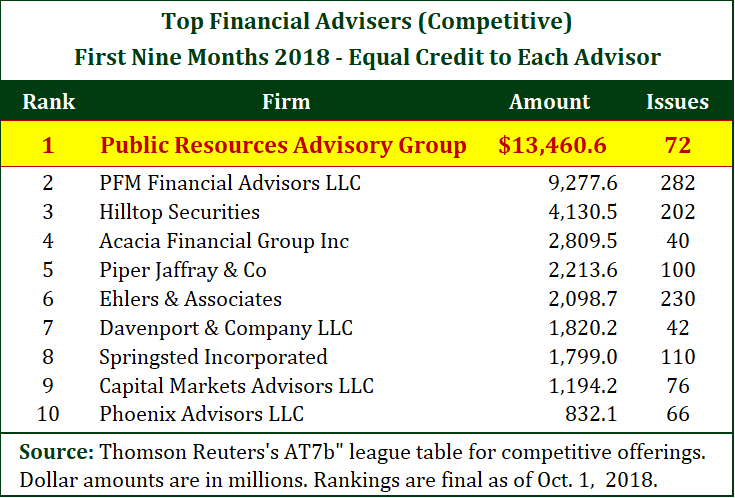 PRAG also ranked #1 as the “Top Financial Advisers (Competitive)” in 2018, having advised on 92 competitive issues totaling $17.4 billion, as well as #2 “Top Financial Advisers (Negotiated)” with 84 issues totaling $18.7 billion. PRAG has been consistently ranked as one of the top three financial advisory firms nationally every year over the past two decades, having advised on over $983 billion of financings for its municipal clients since its inception in 1985. PRAG’s financing experience includes revenue bonds, general obligation bonds, certificates of participation, commercial paper, revenue and tax anticipation notes, bond anticipation notes, securitizations, non-dollar denominated bonds, index notes, stepped-coupon obligations, as well as taxable municipal securities. PRAG is registered as a municipal advisor with the MSRB (MSRB ID K0133) and the SEC (Municipal Advisor Registration Number 867-00146). In addition, PRAG is registered as an investment adviser under the Investment Advisers Act of 1940 in the states of California, Florida, New York, Pennsylvania and the District of Columbia. PRAG ranked #2 “Top Financial Adviser” in the nation for the first three quarters of 2018, with 128 issues totaling $27,137.3 billion, according to Thomson Reuters. 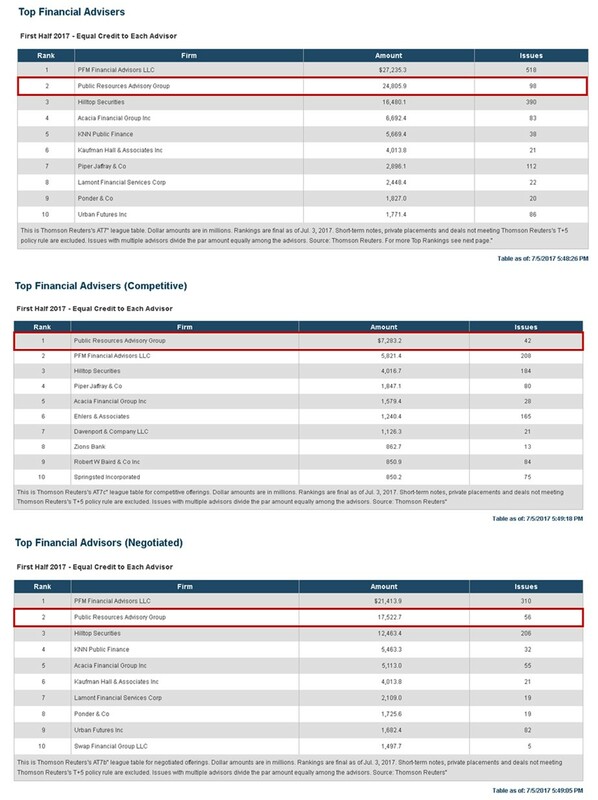 PRAG ranked #1 as the “Top Financial Advisers (Competitive)” in the first three quarters of 2018, having advised on 72 competitive issues totaling $13,460.6 billion, as well as #2 “Top Financial Advisers (Negotiated)” with 56 issues totaling $13,676.7 billion. PRAG has been consistently ranked as one of the top three financial advisory firms nationally every year over the past two decades, having advised on over $963 billion of financings for its municipal clients since its inception in 1985. 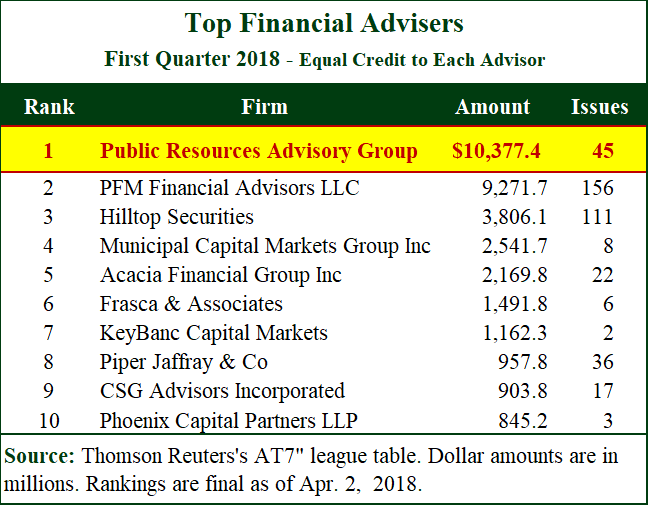 PRAG ranked #1 financial advisory firm in the nation for the first quarter of 2018 with 45 issues totaling $10,377.4 billion, according to Thomson Reuters. 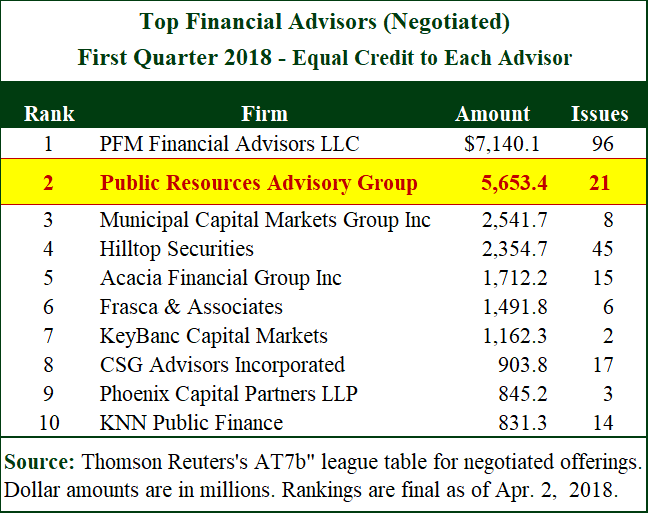 PRAG also ranked #1 as the “Top Financial Advisers (Competitive)” in the first quarter of 2018, having advised on 24 competitive issues totaling $4,724.1 billion, as well as #2 “Top Financial Advisers (Negotiated)” with 21 issues totaling $5,653.4 billion. PRAG has been consistently ranked as one of the top three financial advisory firms nationally every year over the past two decades, having advised on over $934 billion of financings for its municipal clients since its inception in 1985. PRAG ranked #2 financial advisory firm in the nation in 2017 with 196 issues totaling $52,385.4 billion, according to Thomson Reuters. 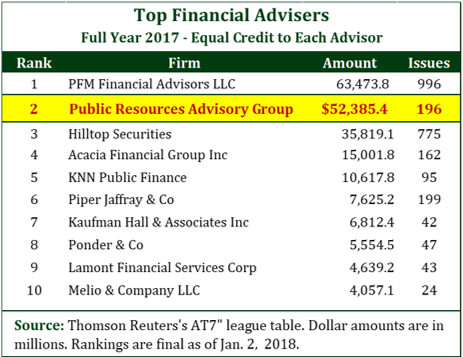 PRAG also ranked #1 as the “Top Financial Advisers (Competitive)” in 2017 , having advised on 99 competitive issues totaling $20,160.7 billion, as well as #2 “Top Financial Advisers (Negotiated)” in 2017 with 97 issues totaling $32,224.8 billion. The Bond Buyer reported PRAG ranked as the #2 financial advisory firm in the nation in the first half of 2017, according to Thomson Reuters. So far in 2017, PRAG has advised on 98 deals, totaling over $24.8 billion. 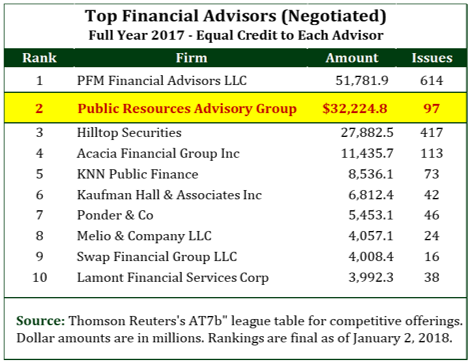 According to the Bond Buyer’s report published July 3, 2017, PRAG also ranked #1 as the “Top Financial Advisers (Competitive)” for the first half of 2017, having advised on $7.2 billion worth of competitive issues, as well as #2 “Top Financial Advisers (Negotiated)” with 56 issues totaling $17.5 billion. Source: Thomson Reuters. 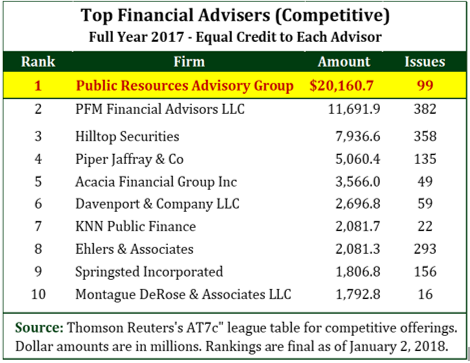 First Half 2017 – Equal Credit to Each Advisor. Based on Thomson Reuters’s AT7 league table. Dollar amounts are in millions. Rankings are final as of Jul. 3, 2017. Short-term notes, private placements and deals not meeting Thomson Reuters’s T+5 policy rule are excluded. Issues with multiple advisors divide the par amount equally among the advisors. PRAG has been consistently ranked as one of the top three financial advisory firms nationally every year over the past two decades, having advised on over $905 billion worth of issues since our inception in 1985. PRAG’s financing experience includes revenue bonds, general obligation bonds, certificates of participation, commercial paper, revenue and tax anticipation notes, bond anticipation notes, securitizations, non-dollar denominated bonds, index notes, stepped-coupon obligations, as well as taxable municipal securities. The Bond Buyer reported PRAG ranked as the #2 financial advisory firm in the nation in the first quarter of 2017, according to Thomson Reuters. So far in 2017, PRAG has advised on 40 deals, totaling over $11.2 billion. 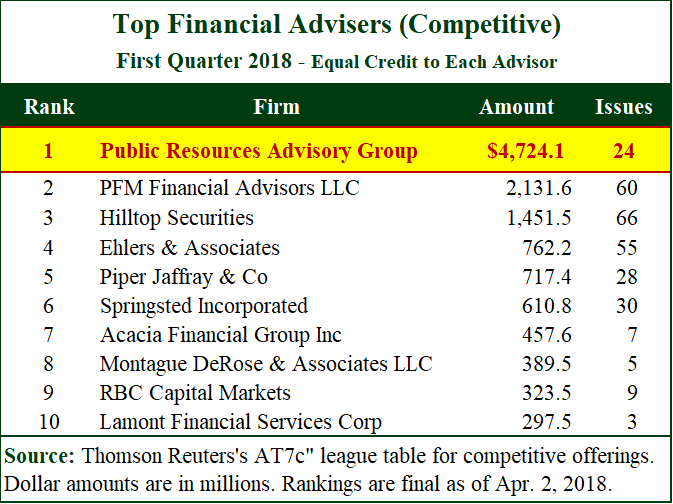 According to the Bond Buyer’s report published April 4, 2017, PRAG also ranked #1 as the “Top Financial Advisers (Competitive)” for the first quarter of 2017, having advised on $4.1 billion worth of competitive issues. PRAG has been consistently ranked as one of the top three financial advisory firms nationally every year over the past two decades, having advised on over 1,200 issues totaling over $486 billion since our inception in 1985. PRAG’s financing experience includes revenue bonds, general obligation bonds, certificates of participation, commercial paper, revenue and tax anticipation notes, bond anticipation notes, securitizations, non-dollar denominated bonds, index notes, stepped-coupon obligations, as well as taxable municipal securities. PRAG remains one of the top-ranked financial advisory firms in the nation. 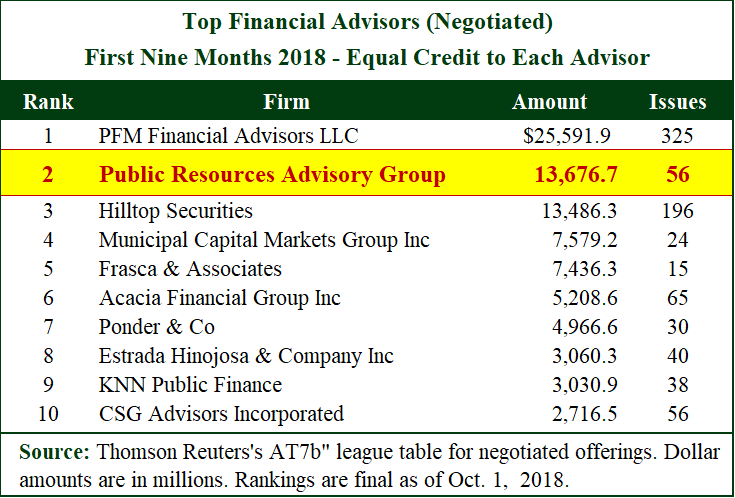 In its 2015 full year rankings, Thomson Reuters named PRAG the third largest financial advisory firm nationally, having advised on 155 deals, almost 10% of the market share. 75 of those deals, comprising 15% of the total market share, were competitive issues totaling over $12.4 billion. The remainder 80 deals were negotiated and totaled $18.4 billion or 8.1% of the total market share. According to the Bond Buyer’s Annual Review published February 22, 2016, PRAG ranked as the top Financial Advisors for General Purpose issuances in 2015, having advised on $21.7 billion worth of issues. 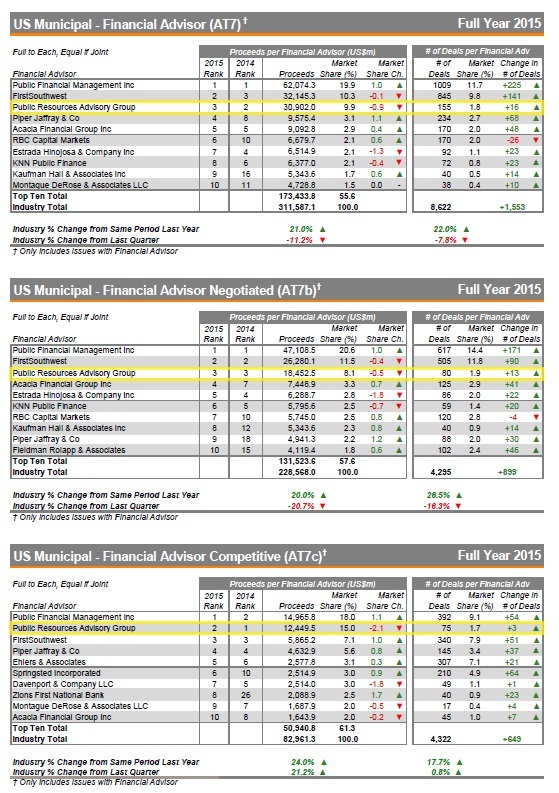 Thompson Reuters US Municipal Financial Advisor Rankings for 2015. PRAG has been consistently ranked as one of the top three financial advisory firms nationally every year over the past two decades, having completed approximately half a trillion dollars of transactions since the founding of PRAG in 1985. PRAG’s financing experience includes revenue bonds, general obligation bonds, certificates of participation, commercial paper, revenue and tax anticipation notes, bond anticipation notes, securitizations, non-dollar denominated bonds, index notes, stepped-coupon obligations, as well as taxable municipal securities. Total: $566,578,600.00* 2,952 *1990 – 2015 only. Steven Peyser, President of PRAG, spoke at the The Bond Buyer’s National Outlook 2015 Conference held February 18 in New York City. A highly debated topic on his panel, “Municipal Advisors Assuming a More Regulated Role,” was the Independent Registered Municipal Advisor, or IRMA, exemption, part of the SEC’s municipal advisor, or MA, registration rule, which went into effect last year. The exemption allows an underwriter to avoid having to register as a MA as long as the issuer retains, as its own MA, an advisor that doesn’t have ties to an underwriting firm and says that it will rely on the MA’s advice. Mr. Peyser discussed tweaking the exemption including the idea that the SEC grant another exemption for sophisticated issuers, which have historically used IRMAs, a suggestion that has garnered support from the industry. Regulators recognized that the new MA rules may still have to be developed, as apparent by SEC Chief Counsel Rebecca Olsen’s statement there was “a lot of work left to do” on the rules in 2015. For more information on this panel and on The Bond Buyer’s National Outlook 2015 Conference please see the article “Municipal Advisors Concerned About IRMA Exemption” published in the February 18, 2015 The Bond Buyer.